You cannot turn the ignition switch to LOCK 0 and remove the key unless the shift lever is in P.
The vehicle may move forward very slightly even in N while the engine is cold. Depress the brake pedal firmly and, when necessary, apply the parking brake. NOTICE When you change the shift lever from D to R and vice versa, come to a complete stop and keep the brake pedal depressed. 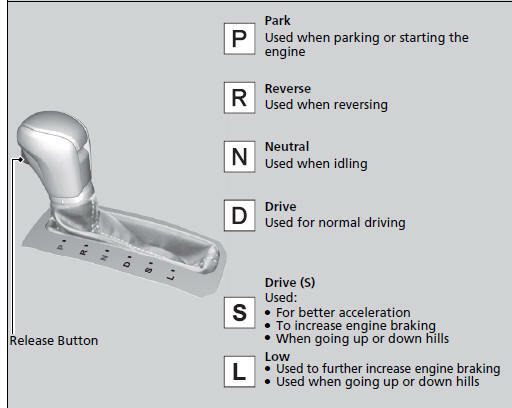 Operating the shift lever before the vehicle has come to a complete standstill can damage the transmission. 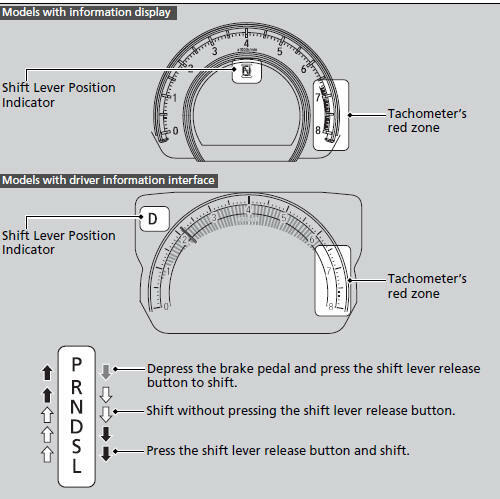 Use the shift lever position indicator to check the lever position before pulling away. If the transmission indicator blinks when driving, in any shift position, there is a problem with the transmission. Avoid sudden acceleration and have the transmission checked by a dealer as soon as possible. The fuel supply may be cut off if you drive at engine speeds in or over the tachometer's red zone (engine speed limit). If this happens, you may experience a slight jolt. It may not be possible to operate the shift lever if the brake pedal is applied while the shift lever release button is held down. Depress the brake pedal first. When shifting positions in extremely low temperatures (-22F/-30C), there may be a short delay before the shift position is displayed. Always confirm you are in the correct shift position before driving.